My eight year old is in second grade this year and birthdays in school are handled differently now - there is one party at the end of each month instead of individual parties. My guy, being a March baby, has his party tomorrow. A few weeks ago an email went out to the parents looking for contributions and I happily pounced on the cupcakes. I decided to go with classic chocolate cupcakes/vanilla frosting and went in search of a good cupcake recipe. While I have a go-to (BEST EVER) chocolate cake recipe, I know it doesn't make good cupcakes. I tried it once and they were rather flat. Delicious, but not very pretty and a bit too tender and crumbly to eat with your hands anyway. Plus, I think the teacher will thank me for not supplying her gaggle of 7 & 8 year olds with espresso-laced cupcakes. I ordered Martha Stewart's Cupcake Cookbook from my library thinking that a recipe specifically for cupcakes would give me the texture and nice domed top I was looking for. I chose to go with the Devil's Food recipe. I surmised the cupcakes wouldn't be as chocolatey as I generally prefer, due to the absence of any chocolate (cocoa powder only), but I didn't think the kids would mind. 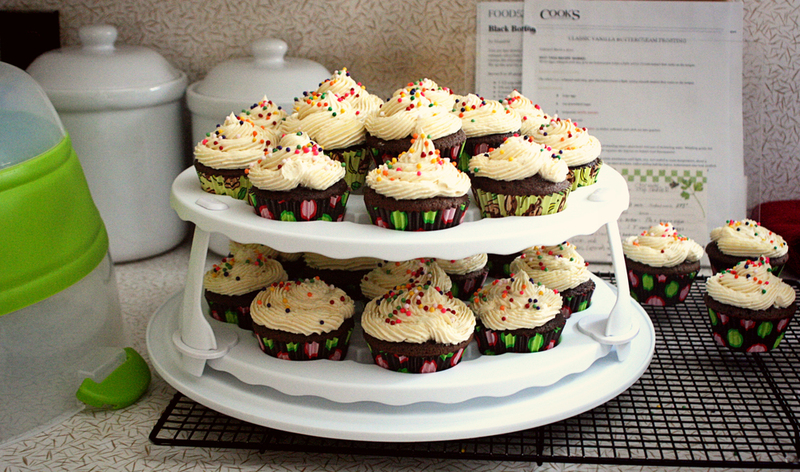 An additional bonus is that the recipe makes 32 cupcakes and I only needed 25. Far be it from me to complain about extra cupcakes! Butter & sugar melted together. Cocoa powder & boiling water whisked. Eggs ready to be added one at a time. The benefit of being a baker's helper. Out of the oven. Time to start on the frosting! The frosting was a no-brainer. I am a fan of frosting that doesn't make your teeth ache and I recently tried a recipe my wonderful friend, Jodie, an incredible baker and cook, recommended. I thought it would be too fussy due to the fact that you have to heat eggs to a specific temperature, but it's not much more difficult than my previous go-to. I made it for the first time a few weeks ago and it was a game changer. Not too sweet, beautifully glossy, easy to spread, and easy to dye. Best of all, it is DELICIOUS. Eggs, sugar, vanilla, and a pinch of salt go in the mixing bowl over a pot of simmering water. 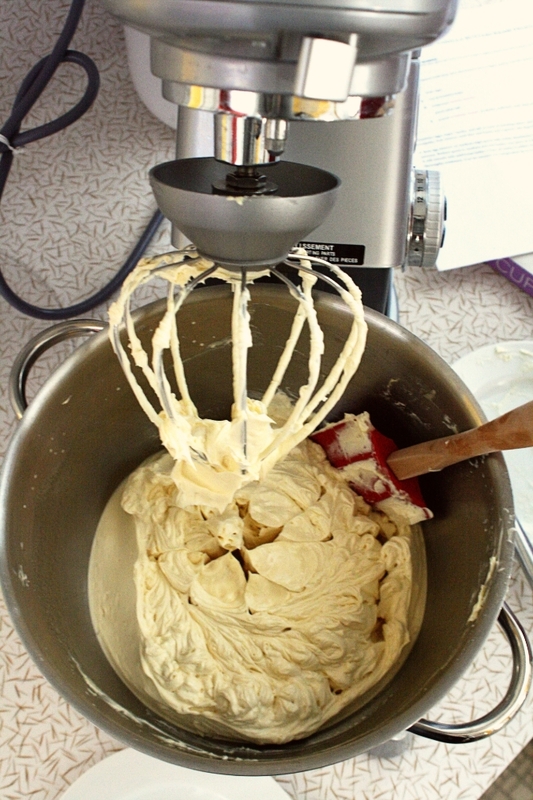 You must whisk constantly until the mixture reaches 160 degrees. 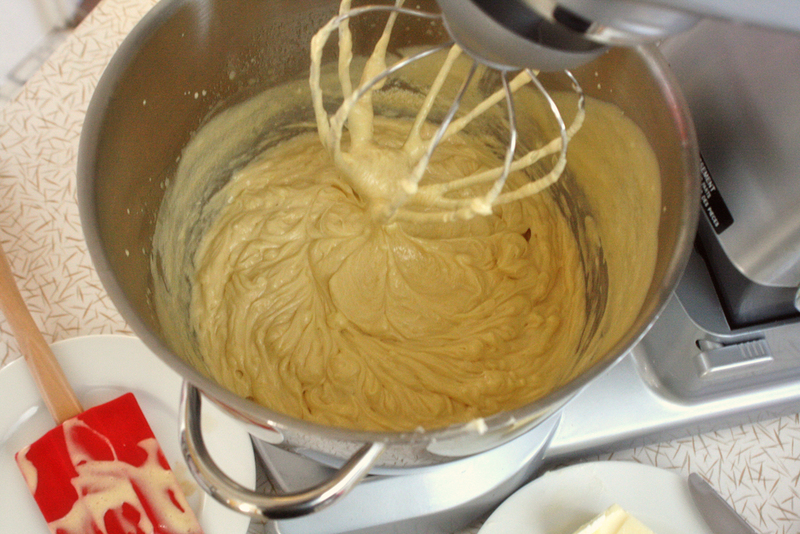 The mixture gets beaten on medium/high for five minutes (it will cool down and become light and airy). After you add about half of the softened butter it looks pretty weird, but there is no need to panic; it is expected. Soon after the last bit of butter goes in you will have a gorgeous bowl of glossy deliciousness. The eggs make this recipe a very, very pale butter yellow. It can be used as "white", but it is by no means snow white. Last year I bought two large decorating tips and I was excited to finally have cupcakes to test them out on. Methinks there is a bit of a learning curve, as they didn't come out quite as pretty as I had hoped, but they were fine enough for me to be satisfied with my first attempt. You only count 29 cupcakes? That, my friend, is what we here like to call quality control. This is the inaugural cupcake carrying of the best birthday present I received last year. Off to a cool part of the house to await tomorrow's delivery!